4 Bedroom Detached House For Sale in Burntwood for Asking Price £340,000. 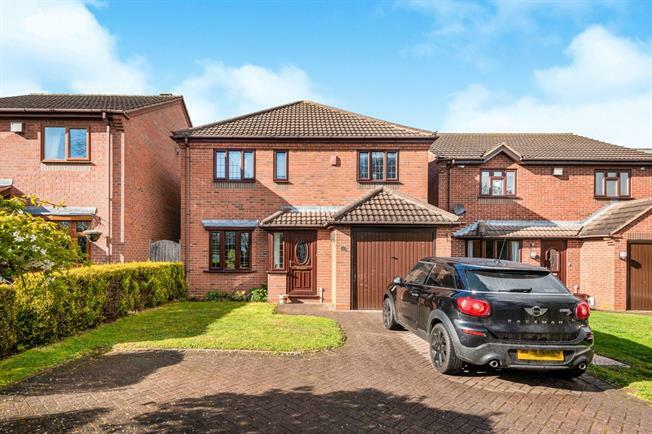 Bairstow Eves are pleased to offer for sale this spacious and well presented four bedroom detached family home in the sought after location of Burntwood. In brief the property consists of study, lounge, spacious conservatory, kitchen, utility room and guest WC. To the first floor are three doubles bedroom, the master with an en-suite shower room, a generous single bedroom and family bathroom. Externally the rear boasts a private enclosed garden bordered with hedges, garden mainly laid to lawn with a variety of shrubs and trees, paved patio area and side gate access. To the front is a large block paved driveway for multiple cars, single garage and a further lawn garden bordered with hedges. Double glazed window to front and side elevation, wall mounted radiator, laminate flooring. Double glazed bow window to front elevation, wall mounted radiator, laminate flooring. Double glazed sliding patio doors leading to conservatory, fire surround with marble hearth and inset housing gas fire, television point, wall mounted radiator. Double glazed French doors to rear garden, laminate flooring and wall mounted radiator. Double glazed doors leading to conservatory, fitted with a range of matching wall mounted and base units, gas hob with extractor over, electric oven, space for dishwasher, breakfast bar, wall mounted radiator and laminate flooring. Door off leading to Utility room. Door leading to side elevation, fitted with a range of matching wall mounted and base units, space for fridge freezer, and tumble dryer, laminate flooring. Double glazed window to rear elevation, built in wardrobes, wall mounted radiator, door off leading to En-suite shower room. Double glazed obscure window to side elevation, tiled walls and flooring, shower cubicle, wash hand basin, low level WC, wall mounted radiator. Double glazed window to rear elevation, built in wardrobes, wall mounted radiator. Double glazed window to front elevation, built in wardrobe/storage cupboard, wall mounted radiator. Double glazed window to front elevation, built in wardrobes, wall mounted radiator. Double glazed obscure window to side elevation, tiled walls and flooring, wash hand basin, low level WC, bath with shower over, heated towel rail. Paved patio area with garden mainly laid to lawn with a variety of shrubs and trees and bordered by hedges. Side gate access to front. Lawned garden bordered with hedges, block paved driveway leading to single garage.